The Medium-Term Strategy (MTS) and Implementation Plan for 2016-2020 outlines the principles upon which strategic decisions regarding the International Agency for Research on Cancer (IARC) programme will be based. This shall be revised every five years. honesty, integrity, independence, courtesy, and generosity. The Agency′s good name and reputation, as well as the credibility to fulfil its mandate, are the reflection of a collective effort of IARC personnel to maintain and demonstrate the highest ethical and professional conduct. 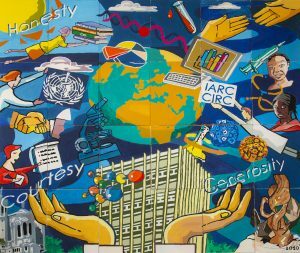 Everyone working at IARC has a responsibility to contribute to the mission and vision of the Agency, by applying fundamental ethical principles and relevant legislation to scientific research, and by avoiding any breach of research integrity. Achieving the above-mentioned standards requires a clear description of those standards and guidance on how to respect them. This information is contained in a number of key documents developed by IARC/WHO and described below. The roles, privileges, and responsibilities expected of any international civil servant are also reiterated in the International Civil Service Commission (ICSC) Standards of Conduct for the International Civil Service, the WHO Staff Regulations and Staff Rules, and the WHO Code of Ethics and Professional Conduct. The ICSC document is an excellent introduction for anyone working at IARC/WHO, because it provides the principles and practices expected of international civil servants. The WHO Code of Conduct for Responsible Research governs responsible research by providing standards of scientific integrity to ensure that the principles of integrity, accountability, independence/impartiality, respect, and professional commitment are followed at all levels of the Organization. The IARC Policy on Scientific Misconduct specifically addresses behaviours that amount to wrongdoing in research and provides guidance on the internal procedures to manage and pursue allegations of scientific misconduct. As a reference, the WHO Policy on Misconduct in Research may also be consulted. The IARC Policy and Guideline on Outside Activities provides a list of acceptable outside activities and includes guidance on the professional and scientific integrity required by IARC personnel when engaging in activities external to the Agency. The document also provides information about who to contact in case of questions on the suitability of an outside activity. All such activities should be included and updated regularly on the Personal Information Portal. The IARC/WHO Policy on Prevention of Harassment aims to promote a work environment free from harassment, in which personnel at all levels avoid behaviours that may create an atmosphere of hostility or intimidation. The Policy also provides a process for the consideration of claims of harassment, and due process for all concerned. All research projects involving human subjects that are coordinated by IARC scientists or in which IARC is involved in any capacity must be reviewed, approved, and monitored by the IARC Ethics Committee (IEC). No such project may be initiated without IEC clearance. In order to identify and mitigate potential conflict of interests, policies and guidelines on Declaration of Interests and Engagement with Non-State Actors are in place and should be closely followed when carrying out scientific activities with outside collaborators. Collaborators may be individuals working on a joint research project with IARC personnel, joining an IARC Working Group or expert panel, or contributing to an IARC publication. The Bioethics and Compliance Officer contributes to an environment at IARC that is compliant with the highest ethical standards and that rests on the integrity of its personnel and research conducted. Furthermore, the Officer monitors, in close collaboration with the Director of Administration and Finance (DAF) and Resource Mobilization and Management (RMO) Offices, all engagements of the Agency, ensuring that collaborations are free from undue influence on the Agency. Specifically, the Officer provides guidance on and managerial support to the IARC Ethics Committee, continuously updates the IARC Ethics Policies that represent all relevant global ethical conventions and agreements, and carries out due diligence and risk assessment on collaborations. In instances of alleged harassment or scientific misconduct, all personnel should seek assistance, and the various resolution mechanisms open to them.